There are white fleeces and then there is Iquita’s fleece. 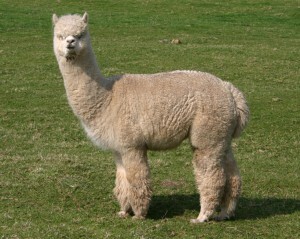 When young her fleece glowed with a dazzlingly brightness and was tightly crimped right throughout from her tail, under her tummy through to her topknot. Included in her four generations of solid white ancestors she has Purrumbete Ledgers Dream in her pedigree from sire, Wessex Accoyo Fernando and Jolimont Sculptor and Serena I from her mother, Francesca. Introducing the full Accoyo of Iquita’s sire has improved on her dam’s fleece weight – Iquita, in 2006, produced at 20 months:- 6.6kg; 17.0µ; 3.2sd; 18.8cv; 0.6>30µ. 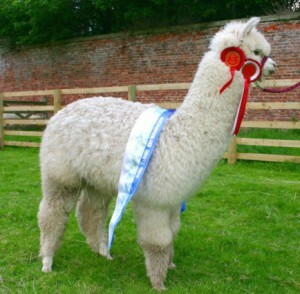 Iquita was Reserve Supreme Champion at the Northumberland County Show 2005; Best Fleece in Show at the Scottish National Alpaca Show in 2005;Reserve Intermediate Female Champion, Northumberland County 2006 and with her sister wonReserve Champion Dam’s Progeny at the BAS National, Newark and Notts 2006. 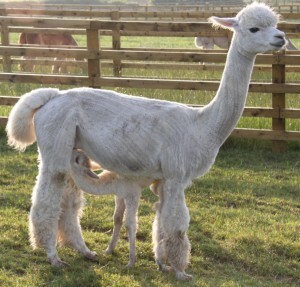 In 2009, Iquita had her own two daughters (Louisa and Melina) competing for her in the Dam’s Progeny at the British Alpaca Society National Show. They won Champion Dam’s Progeny!